With each passing year, I'm realizing that my beauty products (or lack thereof) aren't doing the job as well as they used to in the last few years or so, and that's with trying out other things suggested by friends, articles in magazines, TV personalities or just out of plain curiosity upon reading the promises made on a product's label/box. Sadly, my skin texture is at a place that I don't even recognize anymore, dimples are rapidly turning into crinkles and setting up base camp in other areas of the body that aren't so cute, so it's definitely time to amp up my beauty routine. The crackly, crinkly, uneven skin that seems to have sprung on me overnight, frankly is making me depressed as I'm noticing that my simple easy routine of slathering my body with lotion right out of the shower and quickly exiting the bathroom in minutes isn't quite going to cut it anymore. With this newfound dilemma, I am now finding that it's going to be necessary for me to put in more time and effort into my beauty routine, which sent me on a quest to find the best non-gimmicky ones that would really help me see immediate results (it's ok to dream...). As alluring/tempting it is to seek professional results with a couple of quick shots here and there, the hefty price tag of those procedures left me with no choice but to go to option two, which is the old-fashioned way by using better quality lotions and potions. But I am a complete novice in 'what's the best' beauty product out there as I'm sure you've already noted in my beauty routine post. I didn't have a clue where to start. However, I want to begin the new year with a new beauty regimen using products that will satiate both my desire to regain my skin's elasticity and more importantly- it's youthful appearance. What better way then to curate a list of some of those products that have been highly recommended so I won't have to vex on exactly what cream or lotion is for what. 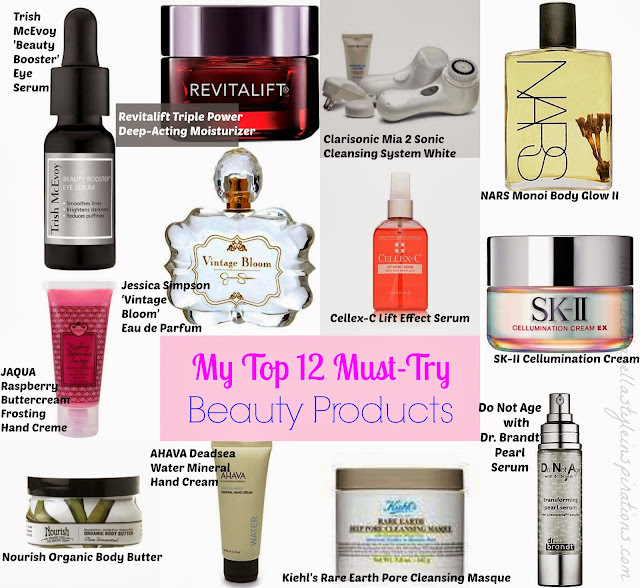 Making part 2 of my list of "objects of desire" are these 12 must-try beauty products. 1.Trish McEvoy's 'beauty booster' eye serum is said to be great for swollen sleepy eyes and dark circles which to me would be a great miracle.// 2.Revitalift triple power deep-acting moisturizer is a special formula that not only hydrates but also makes your skin look and feel more firm. Yes, please!// 3. Clarisonic Mia 2 sonic cleansing system enhances the regimen of facial cleansing by deeply cleaning the pores without any harsh chemicals or abrasion.// 4. Nars Monoi body glow II. I like what it promises: A multipurpose beauty oil for daily moisturizing or massaging. I'm all for a one stop shop type of product.// 5. JAQUA - raspberry buttercream frosting hand creme it's even been said that it can curb a sweet tooth- I guess, I must try it to find out if it's true.// 6. I'm a sucker for pretty perfume bottles - this Jessica Simpson 'Vintage Bloom' eau de parfum 3.4 oz bottle sounds like a Brazilian vacation in a bottle.// 7. Cellex-C lift effect serum spray tones and smoothes the delicate skin under the chin - giving skin a more youthful appearance is right up my alley. Preventive measure is the best medicine.// 8. SK-II cellumination cream illuminating moisturizer is a new favorite.// 9. Nourish organic body butter - a gluten free, vegan pure unscented 3.6 oz is the ultimate moisturizer.// 10. Ahava deadsea water mineral hand cream, 3.4 fl oz. Have heard great reviews on this one.// 11. Kiehl's rare earth pore cleansing masque.// 12. I'm all about maintaining a more radiant younger looking skin and this Dr. Brandt Do Not Age transforming pearl serum 1.35 oz bottle offers exactly that. What's on your fall/winter must-try beauty products' list and what products do you swear by that you would recommend to fulfill the desires I've expressed above?